Sirius A and Sirius B (small dot at lower left). Image: Hubble Space Telescope. There is a puzzle regarding the brightest star in the sky, Sirius, which has been put forward by some as evidence in support of the paleocontact hypothesis. As Sagan and others have pointed out, however, explanations more mundane than those involving extraterrestrial encounters may be to hand. In the 1930s, the French anthropologist Marcel Griaule began a study of the Dogon tribe in what is now the Republic of Mali. Like most native peoples, the Dogon had an extensive body of folklore concerning the heavens. The problem was, much of their knowledge was not only correct but far beyond what they could possibly have acquired for themselves. They knew that the Earth rotates on its axis, the planets revolve around the Sun, Jupiter has four major satellites, and Saturn has a system of rings. They also spoke about an invisible companion of Sirius, which was very small and heavy and circled around the bright star every 50 years. Such a claim would have been treated as sheer fantasy by any Western scientist of the early nineteenth century. But in 1844 Friedrich Bessel detected wobbles in the movement of Sirius which could only be explained by the presence of an unseen companion with a period of about half a century. Eighteen years later, Sirius B was glimpsed for the first time during the testing of a new powerful telescope. Orbital calculations revealed that it has a mass similar to that of its illustrious neighbor, but is 10,000 times fainter. In fact, it is now known to be a highly evolved type of star called a white dwarf. How could the Dogon, without any technological aids, have uncovered the secrets of Sirius B? In his book, The Sirius Mystery, author Richard Temple argued the case for alien involvement.1 On a past visit to Earth, claimed Temple, extraterrestrials gave the ancient Egyptians a crash course in astronomy. This information (though surprisingly not referred to in any Egyptian records) filtered through to the Dogon who are believed to have migrated to their present location from somewhere in north Africa, possibly Libya, several hundred years ago. Although this is an intriguing possibility, Sagan has pointed out that many travelers came to what was previously known as French West Africa in the late nineteenth and early twentieth centuries. Explorers, missionaries, and diplomats, many of them well-educated, would undoubtedly have come into contact with the Dogon, and during such encounters it is not unreasonable to suppose that the parties would have exchanged stories and beliefs. The Dogon would doubtless have been keen to learn more about the objects in the heavens which figured prominently in their own beliefs, including Venus, Jupiter, Saturn – and Sirius. In this way, they may have come to hear about the true movements of the Earth, the Galilean moons of Jupiter, and the rings encircling the sixth planet. Furthermore, even if their mentors had no more than a casual interest in astronomy, they may well have been carrying reference books or have read recently about the discovery that the Dog Star had a tiny, super-dense companion. It is not hard to imagine, argued Sagan, that the Dogon incorporated such details into their mythological framework and then, a generation or two later, repeated them to an anthropologist who was unaware that there had been any cultural contamination. This, however, is not the end of the Sirius mystery because the Dogon include in their traditions the belief that Sirius once appeared red, as indeed it would have done when it passed through its red giant phase in the remote past (see stars, evolution). 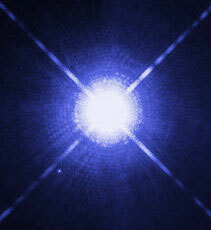 Long ago, as a red giant, Sirius B would have greatly outshone its conventionally-sized, white companion so that the combined system, as seen from Earth, would have looked like a single brilliant red star. The trouble is, according to current theories of stellar evolution, there is no way that Sirius B could have evolved from a red giant to its present white dwarf stage in a matter of a few thousand years. Therefore, the Dogon ought not to have any knowledge of its previous color. One way out of the dilemma, it might be assumed, is to extend Sagan's hypothesis to include the possibility that the Dogon learned about Sirius B having once been a red giant from early European travelers. But that explanation fails on two counts. First, over half a century ago, when Griaule first noted the Dogon reference to the red color of Sirius, astronomers had not established the red giant/white dwarf evolutionary link (in fact, the consensus at the time was that red giants were very young stars.) Second, historical references to a red Sirius are not confined to the Dogon. In ancient Babylonian, Greek, and Roman literature, the appearance of Sirius is likened to that of Mars and the orange-red star Arcturus. Both Seneca, in the first century AD, and Ptolemy, in the second, mention Sirius as being red, while in the sixth century, Gregory of Tours, in a text intended to guide monks in their vespers duties, gives Sirius the nickname Rubela, meaning "ruddy." Unfortunately, even this additional mystery does not require the theory of alien intervention. A credible astrophysical explanation has been put forward according to which, although Sirius B could not have been a red giant in historical times, it may nevertheless have taken on the appearance of one. A white dwarf is made up of a highly compressed carbon-oxygen core surrounded by a thin layer of helium topped with a very thin "atmosphere" of hydrogen. The suggestion is that it might be possible for a small amount of hydrogen to percolate down into the interior and then, with carbon and oxygen acting as nuclear catalysts, for the hydrogen to begin fusing into helium. This sudden, brief resumption of energy-making would release a pulse of heat which, upon reaching the surface, would cause the hydrogen atmosphere to billow out to thousands of times its normal size. As the atmosphere expanded it would cool and glow bright red. Calculations indicate that after about 250 years the atmosphere would collapse again, losing its ruddy brilliance and returning the white dwarf to its previous state of dim anonymity. I am writing with regard to a visual and photographic observation of a red flaring star in the apparent vicinity of alpha CMa [Sirius]. It happened some time ago, but, as usual, we don't have time to investigate. The overall duration of the event was approx. 30 min from the time I spotted the flares. The object appeared to be flaring and visual luminosity, at its peak, almost equaled that of alpha Ori [Betelgeuse]. However, taking into account differences in the perception of brightness of different colors by the human eye, it may have been even higher. The object was almost inseparable from Sirius with the naked eye, but it was clear that Sirius and the flaring object do not have the same point source. Visually the object appeared to be between a 1 and 5 o'clock position relative to Sirius and the horizon. The object was flaring with a lighthouse effect: the light source appeared either unseen or very bright. The "dimming" was very abrupt, lasting less than 2 seconds. I am experienced in visual observations, but I have never seen anything like that. I believe that a terrestrial source for the phenomenon can be eliminated due to the prolonged duration of the event (30 min) with no apparent change of position in relation to alpha CMa and confirmation by another observer who was almost 100 km away. Furthermore, it was a cold night (-6°C) and there was no perceptible star twinkling even at the horizon. At the beginning of the event flares lasted at least 15–20 seconds with intervals between flares less than 5 sec, while at the end of the event intervals were more than a minute and flares (already not so bright) a few seconds at most. The other strange aspect was that the flares had a strange "monochromatic" red color, similar to that of a laser. I would say approximately 6500Å (H-alpha?). Spectrally, M stars have a different color and never look so deep red due to the different emission mix in the spectrum. I hypothesize that the observed flares had only one strong visual emission spectrum line. While I do not have the exact explanation of the nature of the event my guess is that it might be a high frequency rotating brown or red dwarf flaring at that particular time. The event happened at approx. 9 PM GMT +2, on 18 Feb 2007. 1. Temple, Robert K. G. The Sirius Mystery. New York: St. Martin's Press (1976).